Having social media, news channels and digital communication at our fingertips means that content can go viral very quickly. It is important to be on the ball with "What's Hot" and sharing it with your audience. An episode of a Radio 4 comedy show (I'm Sorry I Haven't A Clue) was championed on the Radio 2 breakfast show on Monday 26th November. I had already heard the clip that was being discussed and had a post in draft ready to share with my audience as a 'space filler' on my personal blog. However, I knew that after it had been shared with a wide audience they would be searching for it online so why not direct them to it? With a bit of simple SEO (Search Engine Optimisation) I tidied up the post and published as soon as I got into work. 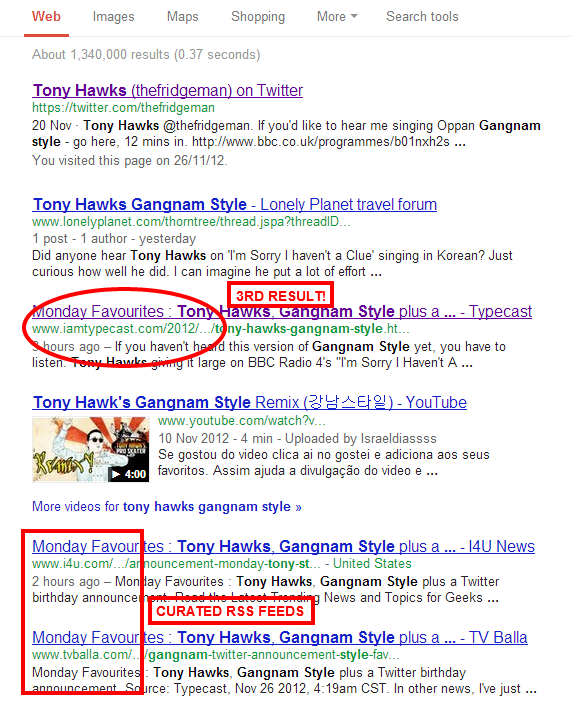 Within an hour, my post - entitled "Tony Hawks, Gangnam Style" - was top of the Google search results (Google Chrome incognito search used so not to skew results). After another couple of hours it had dropped to third but was backed up by curated RSS feeds. Over the next 24 hours it shifted up and down between first and third result. Ensure that you have applied for Google Authorship i.e. 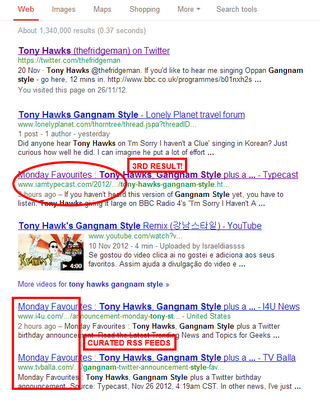 link your content to your Google profile/page so you are acknowledged in search results. Do you have any SEO hot tips? Have you ever had any posts that have gone viral? Let me know in the comments. Additional Tip: Permalink and Search Description is available in both Blogger and Wordpress.